On paper, the market for newly-built, single-family homes looks healthy. Last month, the number of new homes sold on an annualized, seasonally-adjusted basis tallied 319,000. The May reading is the second-highest of the year, and 6 percent above the current 12-month average. These are strong numbers in isolation. However, after accounting for the dwindling supply of new homes for sale as well, the figures look even stronger. In May, at the current pace of sales, the complete, national inventory of new homes for sale would have been sold in just 6.2 months. That’s the quickest pace in a year and a 3-month improvement from a year ago. 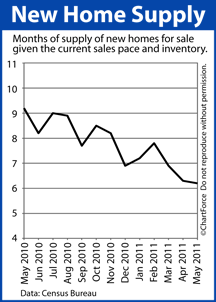 To hear it from homebuilders, though, you’d think that sales were crashing. Homebuilder confidence slipped to a 9-month low this month; builders report slowing foot traffic; and the prospects for the next 6 months appear weak. This is not the portrait painted by HUD’s May New Home Sales report. As a home buyer in Nashville , this dichotomy may work to your advantage. Falling supplies and rising demand correlate to higher home prices. Yet, builders are pessimistic for their market. Therefore, despite the economics, psychology may help buyers experience more favorable negotiations, including complimentary upgrades and other builder concessions. If you’re a buyer in today’s market, it’s a reason to consider the new home market. There may be good value once you know where to look.